You've heard legend of it but perhaps have never been willing to try it. 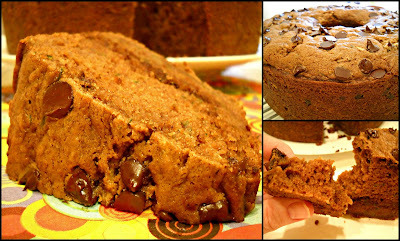 Just too scary to sacrifice your zucchini bread recipe to the chocolate gods. Will it be too chocolatey? Will you still be able to taste the zucchini? 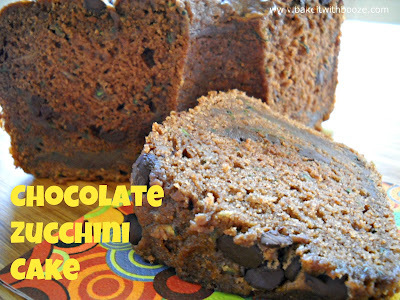 Will the chocolate affect the texture and moistness we all love about a really great zucchini bread? Well, my friends, you're in for a real treat! This cake is super duper moist and with the right combination of chocolate and zucchini. The cinnamon and cloves had amazing depths of flavor. The wine is so subtle and smooth, definitely an adult cake. And, it's a very, very pretty cake to boot! 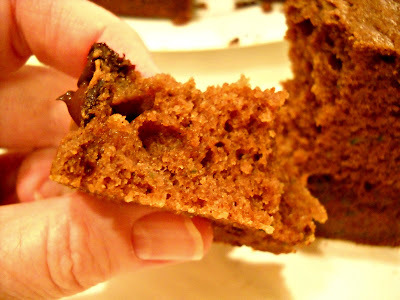 This recipe is based on my Grandma Truitt's recipe, handed down from generation to generation. I did make a few modifications with, of course, the addition of booze and using a different pan. I used Chocolate Wine, which I have seen here and there. It's a combination of red wine, milk and you guessed it: chocolate. I received a bottle from my friend, Melanie, for Christmas last year. It's been in the frig since then...I wasn't really sure how I felt about it until I tried it just before making this cake. It's very interesting and would make a great cocktail or an after dinner dessert wine. Think Baileys or Kahlua. Cream and rich...And, turns out it's also great for baking! Grandma Truitt was such a warm and loving person...I only knew my grandmothers. And, Grandma Truitt always gave us a big hug and a kiss whenever we went to see her. My other grandmother, Bambi, never did that...I don't know why, it just wasn't her style. I think Grandma Truitt, who was a great baker, would be very proud of my homage cake for her! First thing, get your ingredients ready as directed. Set aside until ready to use. Might not be a bad idea to sample that Chocolate Wine, too. Just sayin. 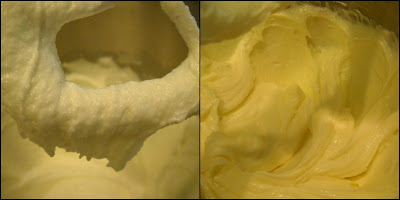 Cream the butter, oil and sugar until light in color. Beat in the eggs, one at a time. Add the flour mixture to the butter and sugar mixture, alternating with the buttermilk mixture. Fold in the shredded zucchini. Spread 1/2 the batter in the pan. Sprinkle with 1/3 cup chocolate chips. Repeat with the rest of the batter and chips on top. Bake as directed...Watch carefully since chocolate anything seems to have a tendency to over cook or even burn. Removed from oven to cool for 20-25 minutes. Turn out onto a plate and flip so the chocolate chips are on top. Cool completely before cutting. 1. Spray one 10 in tube pan (or 2 loaf pans) with non-stick baking spray. Preheat oven to 325 degrees. 2. Cream the butter, oil and sugar until light in color. 4. 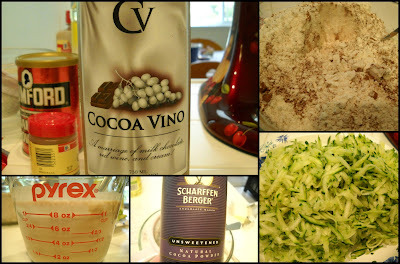 In a measuring cup, combine the vanilla, buttermilk and chocolate wine. Set aside. 5. 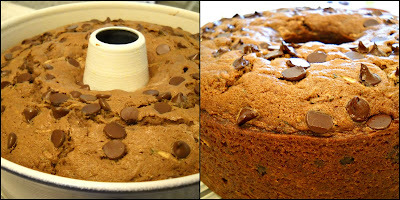 In a medium bowl, combine the flour, cocoa, baking powder, baking soda, cinnamon and cloves. Blend together and set aside. 7. Mix just to incorporate. 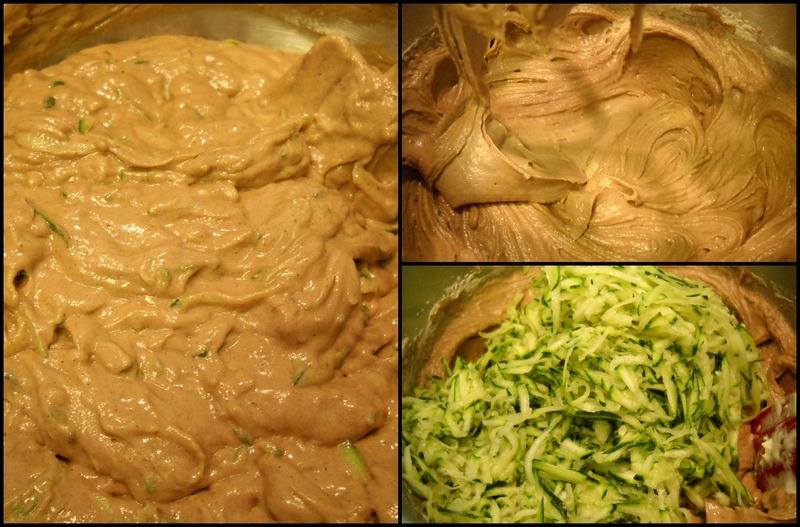 Fold in the shredded zucchini. Make sure to blend well. 8. Spread 1/2 the batter in the pan. Sprinkle with 1/3 cup chocolate chips. 9. Spread the remaining batter in the pan, smooth. Sprinkle with the remaining 1/3 cup chocolate chips. 10. Bake for 55-60 minutes until a toothpick comes out clean. Watch carefully. 11. Removed from oven to a wire rack and cool for 20-25 minutes. Release the sides and turn out onto a plate and flip so the chocolate chips are on top. Cool completely before cutting. *Optional* Mix 1 cup confectioners' sugar and a few tablespoon of chocolate wine to make a simple glaze. So, if you're lucky and have your grandmother still on this earth make sure you give her a hug AND a kiss next time you see her. Grandma would be proud--this looks awesome, Ellen! So, this chocolate wine can be rather addictive...And, I suspect it would make a great cocktail as well. A dessert cocktail, like my chocolate martini recipe. :) Gotta love zucchini cake!! Stumbled onto your blog from Pioneer Woman's comment section. I saw your blog name and just had to come and see what it was all about! LOVE it!!! This recipe looks delish!! I can't wait to try it out!! Chocolate and wine always mix up well together, you can even make chocolate bars spiked with wine on the process. Use only high quality wines to achieve the proper tasty flavor, you can buy wines online that you want to use.